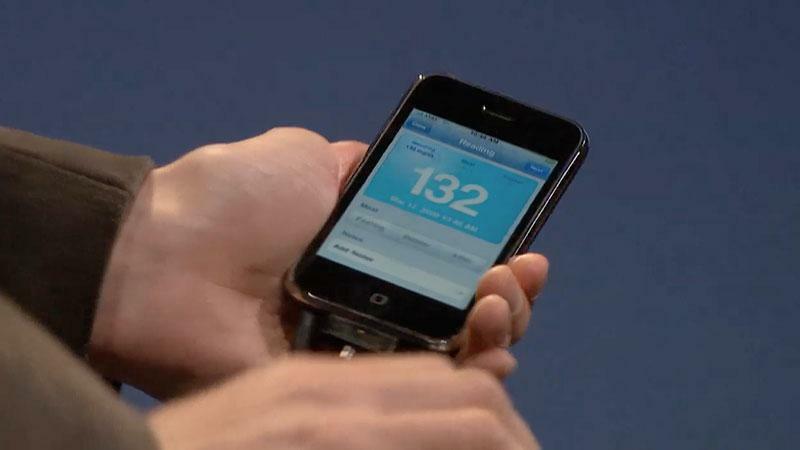 During Apple's iPhone 3.0 event, the presentation of a mobile-attached blood glucose monitor for diabetic users apparently bored some journalists in the room. 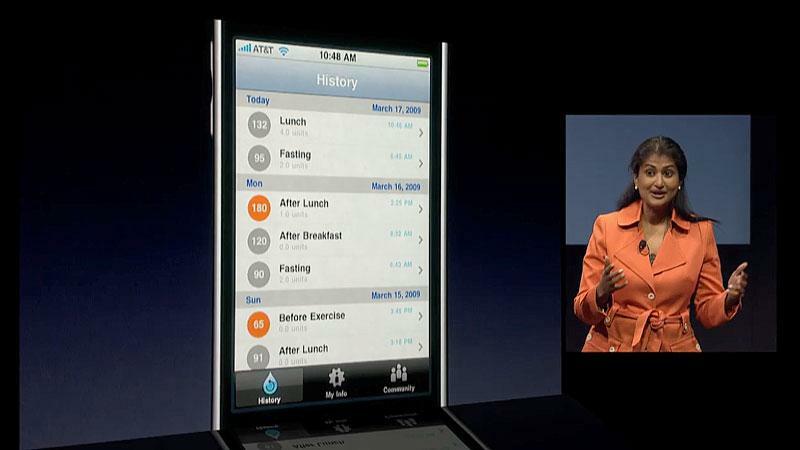 However, the demonstration not only revealed Apple's most important leap yet in mobile devices, but also answered the pleas of a diabetic blogger. Almost a year ago, Amy Tenderich, a San Francisco blogger who maintains Diabetes Mine for people living with diabetes, penned an open letter to Steve Jobs, asking Apple to help apply the design savvy of the iPod to the medical devices that keep millions of people alive. 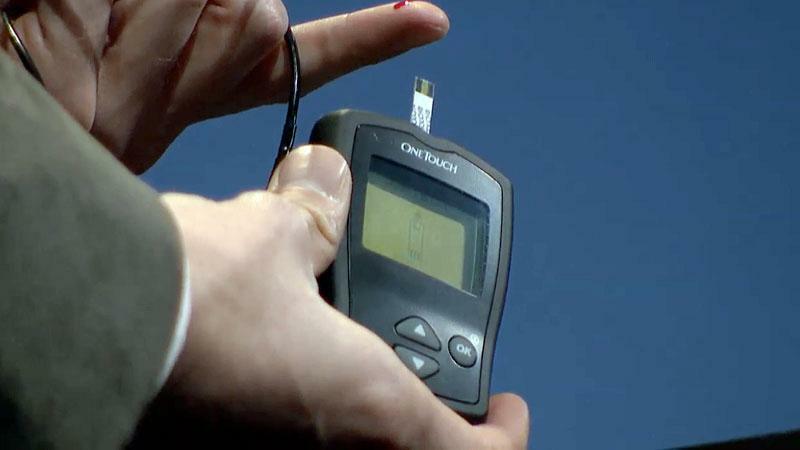 Speaking specifically about the blood glucose monitors or insulin pumps used by people living with diabetes, Tenderich asked Jobs, "have you seen these things? They make a Philips GoGear Jukebox HDD1630 MP3 Player look pretty! And its not only that: most of these devices are clunky, make weird alarm sounds, are more or less hard to use, and burn quickly through batteries. In other words: their design doesnt hold a candle to the iPod." "What we need here" Tenderich wrote, "is a sweeping change in industry-wide mentality  achievable only if some respected Thought Leader tackles the medical device design topic in a public forum." She recommended that Apple start a design contest, or assign the company's design team to create some reference designs, or establish an Apple Med Design School offering courses on consumer design to engineers from pharma companies. Tenderich's plea was picked up by blogger Michael Arrington of TechCrunch, where it certainly caught Apple's attention. Then nearly a year passed. Rather than sponsoring a contest or coming up with its own designs, Apple did what it does best: it arranged to put its development tools in the hands of experts in the field who could solve the problem. Rather than making making medical devices look like the iPod, Apple made it easy for devices makers to work with the iPod and the iPhone. The new accessory support in the iPhone 3.0 SDK will enable, not just a specific group of medical monitors, but a wide ranges of devices to benefit from the millions of dollars of research and development Apple has put into multitouch interfaces, mobile technology, human interface design, and the iTunes App Store. Apple's original Macintosh was mainly an elegant curiosity until it was launched into the mainstream by the laser printer, a component of Jobs' Macintosh Office strategy to give the Mac a killer application. Years after Jobs left the company, the Newton Message Pad, Apple's first attempt to deliver a mobile device, failed to ever reach a level of utility that could justify its $1000 price tag. It had no killer applications. When Jobs returned to Apple, he gave Newton a year to turn around and then axed the product when it was clear it needed so much work that it would be obsolete before it could ever find a niche. In its place, Apple created the iPod as a mobile device with a clear purpose: music playback. After rapidly growing into an empire, Apple parlayed its success into the smartphone market with the iPhone. With iPhone 3.0, Apple is not just adding features to its phone but rather broadening its mobile device platform into an entirely new product category. The differentiating value of the iPhone isn't that it can be used as a phone. Instead, it's that it can run high quality, secure software that is easy to deploy, resulting in a cheap, high volume market for mobile apps. With the ability to control and record data from USB and Bluetooth devices, the iPhone and its iPod touch sibling are now far more powerful general purpose computers than the Newton, with more mature development tools and a far larger installed base. With 30 million devices now sold, Apple's mobile platform represents a larger cohesive platform than Windows Mobile. That's because the Windows Mobile installed base of 50 million (a large portion of which is now obsolete) is split between touch screen devices run by a stylus and non-sensitive "Windows Smartphone" devices with only button inputs; its various models all use different port connectors, some don't have WiFi, all have different cameras and screen resolutions. The same can be said of Symbian phones and BlackBerry devices. Apple's unique App Store is being copied by every other phone vendor, but their various models don't all run the same software. Most smartphones only run the operating system version that shipped with the phone, again leaving a fractured installed base. Even Sun's Java ME, an effort to abstract the differences in various phone models, is plagued by incompatible differences and bugs in the various Java runtime implementations on each phone. That leaves the iPhone and iPod touch among the largest (if not the largest) platforms available for developers to target. It's also the most profitable, despite the fact that software is also the cheapest for users, typically only a couple dollars. Many phone developers have called its software development and deployment tools the best available. These factors will all combine to enable experts in various fields to develop embedded devices that work with the iPhone, from stereo components to remote controls to gaming devices to medical sensors to bar scanner to diagnostic tools to gym equipment to environmental sensors to security devices and so on. 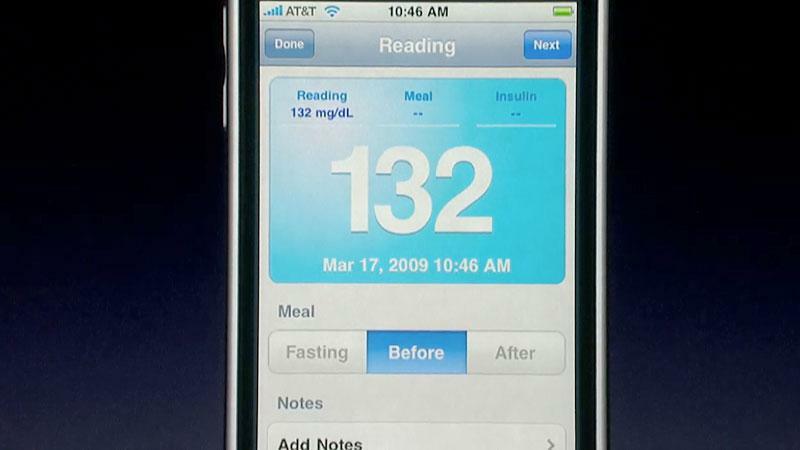 Rather than only putting its resources to work in solving diabetes-related devices, Apple has empowered whole industries to solve their own challenges, using the iPhone as a hub for providing accelerometer input and multitouch controls, a sophisticated human interface with animated display feedback, logging and reporting features with statistics graphing and data visualization, and data upload to a computer or online service. The pundits who mocked the device as the "Jesus Phone" are now experiencing its second coming.